Didn't know that they did built in gas ones! result! Don't do it, people! 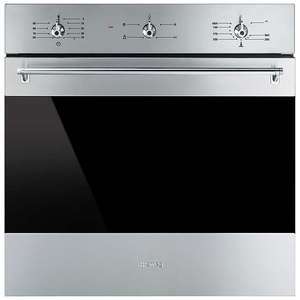 The Smeg cooker I have is the worst I've ever bought. I've had a bottom of the range Indesit and a middling New World. Both worked fine and had plenty of life in them when I sold them on. This thing, one of the gas hobs failed after a few months, the element in the oven died (fixed that myself), the oven door seal keeps falling off (on my third). Not sure how Smeg have acquired any sort of reputation, my experience of them is terrible. Ordered an electric AEG a few weeks ago. Does gas cook better? Had a stoves gas oven and would say yes, electric is a dryer heat if that makes sense making cooking say roast potatoes tastie? .Electric ones are a hassle cleaning them with the fan and element problem areas.